Product prices and availability are accurate as of 2019-04-25 09:49:24 UTC and are subject to change. Any price and availability information displayed on http://www.amazon.com/ at the time of purchase will apply to the purchase of this product. Olaf is 3"W x 4"H, Kristof is 4"W x 10"H, Anna is 3"W x 8.5"H, Elsa is 6.5"W x 8.5"H, Sven is 9"W x 10"H Ideal for decorating any room in the home or office; Safe for painted walls and other smooth surfaces! 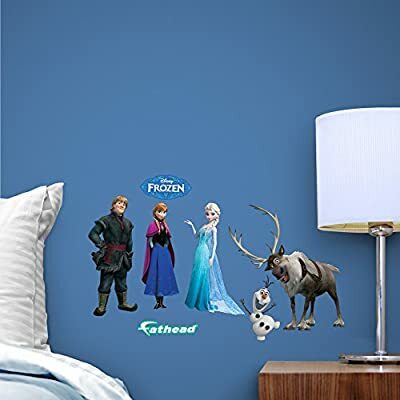 Just peel, stick and impress; It's that easy Thick high-grade vinyl resists tears, rips and fading; MADE IN THE USA; Officially Licensed - Fathead Wall Graphic - Decor - MAKES A GREAT GIFT From Disney to the National Football League and everything in between, Fathead has you covered; Order your passion from Amazon today Item comes with all the extra decals, as shown, at no additional cost!